And here we are! The first of the final two pages for Volume 2’s Prologue. Yes, everything was one page up until this point but I couldn’t be stopped so this final one gets to be two! Most importantly, our regular artist, Caroline, is back for these pages! If there was anyone to get Seren off that balcony and brooding after these few weeks, it had to be Caroline. 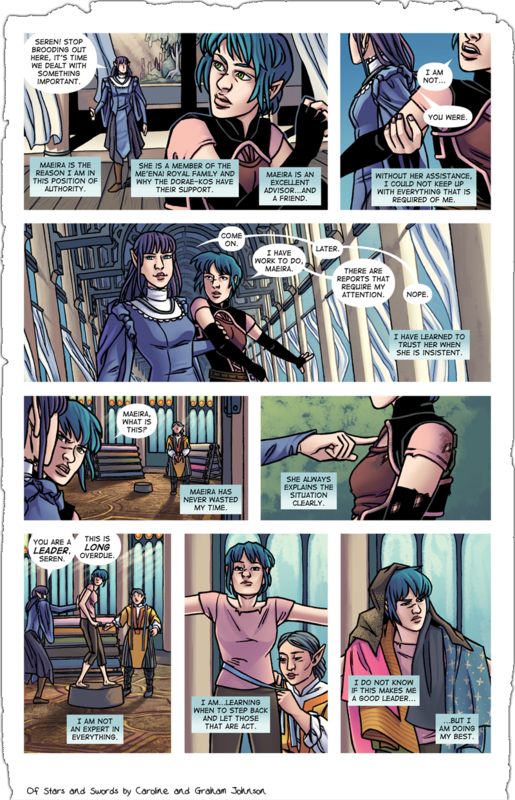 But even with Caroline’s return to the art, we wanted to try something a little different and see how the page would look without panel borders. I don’t think we’ll stick with this for Volume 2, but it’s a fun experiment! This page also begins to put an end to our dancing around of the current political situation that Seren finds herself in and how she fits into it all. Exciting, I know. MORE exciting is that we’re finally introduced to the first new character that’ll be joining Seren once Volume 2 kicks off properly. Maeira’s really great and, as you can already see, is unlike anyone Seren’s dealt with before. If you’re curious, we’ve got a post over on our art blog showing how Maeira’s design has evolved and where it stands at the moment. Next week comes page two of this scene and the final page of our prologue. Until then, as always, the entirety of Volume 1 is on Comixology for $9.99.